Synergyzer: Give a brief overview of the company that owns Dunya TV. Omair Khan: Dunya TV is owned by Mian Amer Mehmood, who owns Punjab Group of Colleges and Universities as well as Mohammad Ali Jinnah University (MAJU) in Karachi & Islamabad. Education has been his forte. He has been in this field for the past 25 years. At the same time, he has other business investments in the real estate sector. He started the media venture in 2008 with the launch of Dunya News which is now a full-fledged media group with the addition of Dunya Urdu newspaper and has future plans for adding more channels to the bouquet, starting with an entertainment channel. 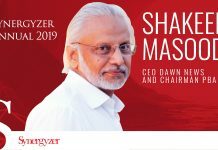 Synergyzer: What are some of the major dynamics that have evolved within the TV industry in the past ten years in Pakistan? Omair: In the last 10 years, media industry has boomed and it has seen most growth in terms of the number of news channels that ride the airwaves today. In today’s world where audiences’ prefer to stay aware and informed, their access to the world is made easy through news channels both local and international. Back in the days, we only had PTV and NTM; hence the news genre wasn’t developed as such. Today, there are more news channels than ever before, keeping audiences informed, empowered and creating public awareness. Other than entertainment & news; TV channels have further diversified into other genres such as music, fashion, religion and sports to the liking of every individual. Secondly, advertising expenditure has grown exponentially with greater focus on TV as one of the most efficient medium for marketing & mass targeting. Compared to the rest of the world where digital is the new medium of growth, TV in Pakistan continues to enjoy the largest audience and advertising share. As advertiser’s confidence continues to rise in Pakistan, so does the advertising pie. Interestingly our adex to gdp ratio is still lower, compared to developing countries, which indicates further room for adex to grow in the coming years. Thirdly, a job in TV industry was never considered a stable career before but now it is respected and is sought after as a profession. Earlier in Pakistan, we had limited talent on-screen but now there are new additions on TV on an everyday basis. There is a lot of potential in this field & what we we still need is proper talent management agents and HR specialists to streamline our industry. In terms of viewership genres, sports has also enjoyed a certain love of the niche audience beyond cricket lovers. It’s not limited to live cricket screenings or international cricketing events. There are analysts and presenters on local channels discussing football, tennis , golf etc. Cricket heroes like Wasim Akram and Ramiz Raja have also helped uplift the image of local experts most of whom are known globally today. Synergyzer: What percentage shift has incurred in ad spend towards the television medium from other media? Omair: TV has enjoyed an undisputed share of advertising spend over the years, print and outdoor followed. There are seasonal and event based peaks for both latter mediums like elections etc. Internet is the newest advertising medium available and it is being well utilized, the penetration in urban areas is quite decent and continues to grow. However, companies spend most part of their advertising budget on TV as it has a bigger impact compared to other media. This change started in early 2007 as it became apparent through the researched approach adapted by companies to test which of their marketing mechanisms were working better than others. Print has been taken over by electronic; though a loyal print readership base still exists but the shift towards electronic media is prominent when we look at the revenues made by print media in comparison to the television. Synergyzer: How has television shaped the promotion of brands in the recent years? Omair: A major change has taken place vs. old days in the way TV has shaped the marketing and advertising of brands. Different innovations have been introduced by channels; branded entertainment including brand’s message integration and placement is on a rise, there are fixed spots near premium programs to enhance recall for viewers, we see more reality shows on international format supported and sponsored by major brands etc. All these changes define how television has reshaped marketing, media and advertising but most importantly brand promotion on TV today is being done more tastefully and subtly than before. Synergyzer: With the advent of different channels, how have career paths evolved? Omair: Overall, in terms of jobs and careers, there are numerous choices available in the media industry now. Earlier we only had PTV, hence, there were fewer designations and limited technical staff. Now with the growth within electronic media, there are more specializations to choose from. There is also an increased interest in Journalism and Media Sciences studies as the need for professionals to run this industry became evident more so in the recent times. Due to this; universities are seen introducing specialized programs within media, journalism and production to train students for a career in media. Hence, now we are very much aware of designations such as media planners, buyers, content experts that were hardly known before. Synergyzer: How have you seen PEMRA’s role evolving over the years? Does it involve controlling the mushroom growth of channels and ensuring quality content? Omair: PEMRA’s role evolved as the television medium evolved. Yet, they still need to implement effective controls on shows and benchmarks to be made obligatory, small example could be enforcing content classification by audience for example parental guidance indication on programs with explicit content. This is being fair to not only the audiences but also introducing channels to the international regulations which are appreciated globally. These controls are a necessity as television has a greater influence on audience as a communication tool and impacts a larger group of population. Of course, exemptions can be made on live programs, but care should be taken in general. In fact, I believe all media stakeholders should take the initiative of maintaining global standards in terms of content, speech and technical standards so Pakistani media is seen and appreciated as serious business. Synergyzer: How has the role of censorship policies evolved in the past ten years? Omair: I feel they have become more lenient and adaptive over time on the basis of popularity and audiences. PTV and PEMRA have always played the role of censorship; however they currently are seen as old school. We now have Turkish and Spanish content being played on our TV channels, which is even bolder, reflecting fewer restrictions. On the other hand, the audience has become bold as well and have shown acceptance of the foreign content. Nevertheless, Dunya is very particular about what is being played on television, as we consider it our responsibility to monitor and filter any inappropriate or culturally sensitive content. Synergyzer: A number of unregulated TV channels keep emerging in the country. How is their content and broadcast regulated? Omair: Pakistan Broadcasters Association (PBA) brings together every channel’s head to discuss issues and limitations from time to time in order to regulate TV channels. As TV stations have a very strong power to influence general public towards a particular direction or agenda, PEMRA ensures the content is neutral and supportive to the economy in some way or the other. I think it is important for us as stakeholders to maintain a strictly mature attitude by adapting highest business ethics on our own, instead of being reminded to comply on basic morality. Synergyzer: Recently, we have seen a number of negative PR activities being conducted involving anchors from different TV channels. Is there any code of conduct to stop such activities from happening? Omair: There is no code of conduct, however there should be one. There should be a benchmark to be followed by all, not that one channel bans a controversial figure for right reasons and another goes on to hire them. That said, the ban should be for the right reasons. Synergyzer: Why is there a lack of competition in the TV viewership research sector? Omair: People meter is a high investment project; there is a need for upgrade and improvement but the returns are high. Despite this, not many channels are pushing for it. On the other hand, PTCL has launched its smart boxes that will supplement the data. They plan to install these in around 100,000 households; it’s a good start but that doesn’t give large scale coverage. However, it will certainly give us a good picture to plan for future.